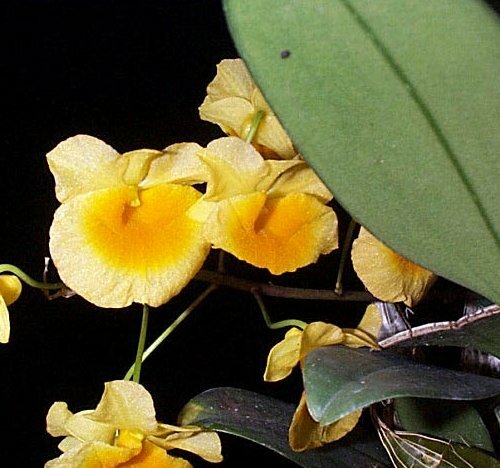 Home|Floral Library|Dendrobium Orchid – Dendrobium spp. Decorative Life: 14 days or more. Vaselife differences are mainly caused by growing condition and cultivar differences. Holding in flower foods before packing and shipping is not necessary as a good hydration or bleach solution can be equally effective. flowers harvested in the winter last longer than those harvested in late summer. Member of the Orchidaceae (orchid family). Native to Asia, Australia and the Pacific islands. Related species include Cymbidium, Cattleya, Paphiopedilum, Phalaenopsis. Flowers are 1-2 inches across, with 3 colored sepals, 2 petals and a 3rd petal forming a lip, a spur extends from the back of the flower. Stems are 12-24 inches long bearing up to 15 flowers. Plant is an epiphytic perennial, in nature it grows on tree branches. Plant is classed as a monocotyledon, leaves mostly parallel veined. Chill sensitive, store above 55F. Storage at 50F should be no longer than 4 days. From the Greek “dendron” (tree) and “bios” (life) referring to their epiphytic habit (attaching to tree branches). Orchids have long been highly sought after, probably for the unusual beauty of their design. Orchid hunters in the nineteenth century collected them by the ton, and chopped down as many as four thousand trees at one time for the Orchids growing on them. This family is generally believed to contain the largest number of species, somewhere around 30,000.